It's contest time again everyone and this prize is PERFECT for anyone who is living healthy and enjoys the outdoors. You can win an ultra-chic, way-cool, radical-ride known as the Fuji Crosstown 2.0 Bike from our friends at Lipton Teas in promotion of their "Free Your Y" campaign on behalf of their new line of white teas. Apparently, the new Lipton White Teas come from "young" (that's the "Y" they are referring to) tea buds to give them their amazing youthful flavor and this is the basis for developing "Free Your Y." Whether you are young, feel young, or wanna feel young again, Lipton is celebrating the things people to do recapture the essence of what it means to be youthful, energetic, and full of promise. It's a nice concept to think about, especially for those of us whose lives have been radically changed for the better through livin' la vida low-carb! Your vote will determine who wins the $25,000 grand prize as well as two runner-up $5,000 winners. But you only have until Friday, May 30, 2008 to enter and the winner will be announced on Monday, June 2, 2008. GOOD LUCK to all the entries! But what about the bike, Jimmy?! I hear ya, I hear ya...to win this snazzy bike for yourself (man, I'd love one! ), all you need to do is vote for your favorite video and then leave a comment (no anonymous submissions permitted) at this blog post stating who you voted for and why. Since the voting at the "Free Your Y" contest ends on Friday, so will this bike contest at 11:59PM EST--SO DON'T DELAY! The winner will be chosen at random among all the entries and he or she will have delivered to their home a Fuji Crosstown 2.0 bike, 5 coupons for a free 1.5 Liter Bottle of Lipton White Iced Tea, and a $75 check to offset the expenses for a professional bike assembly. WOO HOO!!! 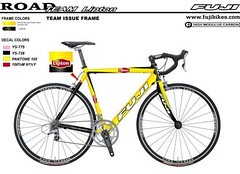 The Pepsi/Lipton Partnership will provide a check for $75.00 to be used for professional assembly of all Lipton Fuji bicycles awarded. Neither Pepsi Co. nor Unilever is liable for any injuries, damages or accidents that may result from the receipt, assembly or use of this bicycle. So are you ready to "Free Your Y" and vote for favorite video submission in the Lipton contest? Then head on over to YouTube, place your vote, come back here and tell us who you voted for and why, and then wait expectantly for your name to be announced the BIG WINNER! GOOD LUCK EVERYONE!!! Ok, there were a few really good ones but the one I voted for was...... YOUNG AT HEART by Eric Michael Hopper! It was cute and catchy! I enjoyed watching it over and over again. He put a lot of time into it and it turned out awesome!! I voted for The Human Rubberband because it cracked me up and looks like something my friends and I would try. I agree several were good, but my absolute favorite was the Human Rubberband, because that video showed exactly what would happen if a bunch of kids found a hugh rubberband. It was very youthful thinking. Fun Videos. those were fun to watch! i voted for Freeing My Youthful Spirit! From: alta8bird because he made the video for the contest instead of just sending in a random clip. He was also totally into what he was doing! It was a close call with lots of great videos, but I voted for the Guy with Tina and the Polar Bear. Creative and funny. Besides now I'm in love with Tina. (just kidding) The Human Rubberband was also very creative. Great set of videos. I voted for Throw Away Cans (#13). It was clever, well conceived, and well executed. The music got a lttle old but at least they were moving! I voted for Human Rubber Band. I could just see a bunch of grade school kids going nuts doing this! I voted for Human RubberBand. It made me laugh. I would so like to try that! The other entries were great though,especially the can thrower, it was a hard choice. I voted for the The Human Rubberband because I would really like to try that sometime! That was hard, but I voted for "Freeing my Youthful Spirit" by ALTA8BIRD. The smoothness of the aerial shots was great, the dog barking and licking his face at the end was sweet! I really liked the "Ted Krueger" for the sheer physical strength of that performer, as well as the video from "Lapk", the fisheye angle, the beat from the skateboard and the moves were awesome! Thanks again for sponsoring such a great contest!